My go-to mani lately has been the glitter gradient I posted about a while back. The thing I like the most about it is that looks like I spent a lot more time on it than I did. It’s also a very handy technique to quickly make a chipped manicure look fresh again. 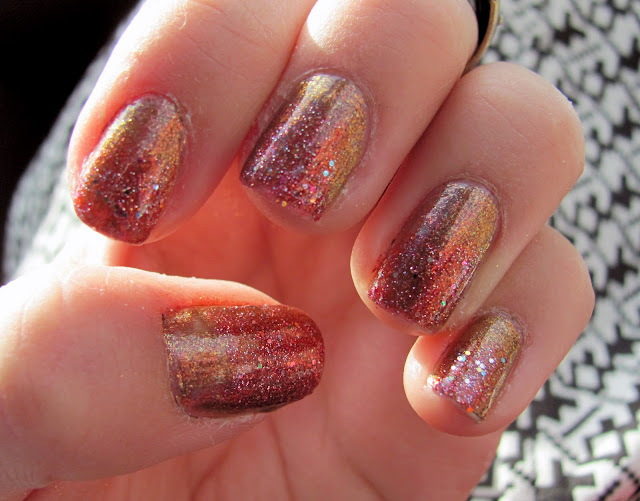 If there are chips and wear at the tips of your nails, simply swipe on a quick gradient of glitter on top. And it never fails to get compliments. I tried the new Designer the Better color from OPI’s Muppets collection, but forgot the topcoat. Two days later I had a bit of wear, but I didn’t have time to remove the lacquer and re-polish, so I dabbed a bit of Excuse Moi from the same line. Voila! Brand new mani! Covering up chips isn’t the only use for a glitter gradient. You can use it to dress up that new shade of polish you just got. For instance, I really wanted to try the mustard-colored lacquer I picked up at H&M a while back, but, as much as I liked it, something was missing. 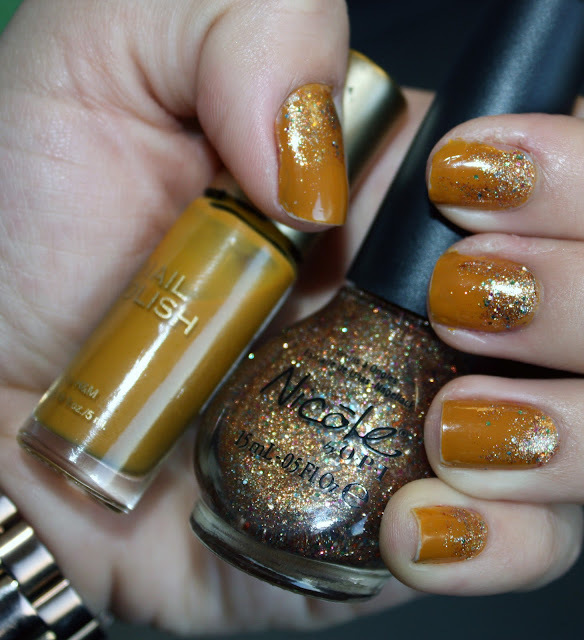 Add a bit of gold glitter a la Nicole by OPI’s Disco Dolls in an inverted gradient and the problem is solved! What is your signature mani? I’d love to know! Gotta love glitter manis - easy and chic! Looks adorable as always! Ohhh, so perfect for the holidays! I love these! Going to le copy! You are so nail savvy!! I paint it on, but make sure there isn't very much on the brush. The less you have on the brush at a time, the better; it gives you more control over the gradient. Thanks, Tatiana! I'd love to see how your mani turns out!